As the name gives away, Betcoin Poker is another cryptocurrency friendly poker room that accepts Bitcoin and Litecoin. Alongside their poker room they have a neat sportsbook that can be used by everyone in the world to place bets using either virtual currency. The poker room offers everything you would expect, has a nice player pool of regulars and recreational players to ensure there is action around the clock. Combine all that with a few impressive MTTs with juicy guarantees and the site is off to a flying start in our books. If you are a cash game grinder you will fit right in at Betcoin Poker. They have games running from .01/0.2BTC all the way up to 25/50BTC. At the time of writing this review we saw one table running at the highest stakes, with most of the action at 2/4BTC, .25/.50BTC and several tables running at the micro stakes. The majority of cash games that run are full-ring with only a few 6-max and HU tables running. 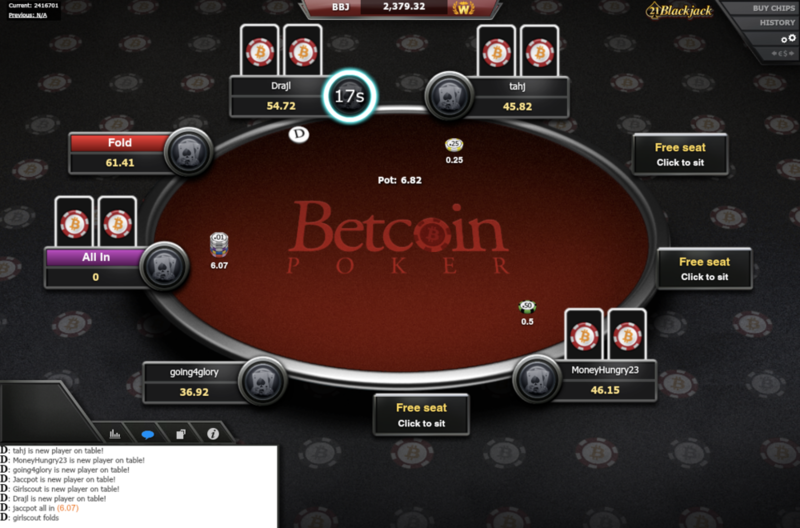 Betcoin Poker does offer Omaha cash games but tables can get quite scarce during off-peak hours. Rake at Betcoin Poker is amazing. The Poker room recently dropped rake to 2.5% for all tables and to 1.3% for HU tables at stakes .25/.50BTC or lower. Betcoin Poker provides poker players with the lowest rake caps in the industry increasing your bottom line. MTTs is where Betcoin Poker really showcases what they have to offer, with a bunch of MTT freerolls which have fields as large as 600 players. Micro, small, medium and high-takes MTTs usually will have over a 100 runners on a regular basis. Unlike SealsWithClubs, Betcoin Poker runs a number of satellite tournaments for players with smaller bankrolls to win tickets to the bigger MTTs. For a fairly new site Betcoin Poker is doing pretty well on the tournament side of things. Betcoin Poker has a sit-and-go section which is active at the lower stakes but not nearly as much as their cash games or MTTs. All MTTs accept late registration up to an hour which was a nice touch. While it would have been cool to have a phone number to call, Betcoin Poker’s customer support service is pretty good. They offer live-chat support from 8am-5pm EST, email and an option to raise a ticket if you have a problem with your account. Betcoin Poker is complete with a FAQ and knowledgebase forum where you can enter in key search terms to figure out the problems to common issues players have. Getting Bitcoins on Betcoin Poker is as you would expect, very easy. You are only required to create a username and password with the handing over of your email as optional. All first time deposits will get a 100% bonus up to 1BTC which will be released instantly. You are required to rake a certain amount before you can withdraw the bonus. Betcoin Poker reminded us of Pokerstars which is never a bad thing. They offer a web-based and a downloadable client, we managed to multi-table with no problems, experienced no lag and the gameplay was fluid and clean. If only for the deposit bonus Betcoin Poker is a safe bet for anyone who is looking to play some online using Bitcoin or Litecoin. They are a fairly small poker room but we loved almost everything about the site.